Electric Winches - Thern Heavy Duty Power Winches | Thern, Inc.
Power and precision on any work site. Our heavy duty electric winches are built to travel long distances, accommodate faster line speeds, and give you the ultimate control. 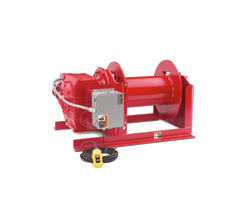 Thern electric winches can lift, pull or position up to 100,000 lb. Secure load control, reduce maintenance, position accurately and run a dependable operation with mighty features like welded steel drums, flange-style roller bearings, extended solid steel drum shafts, load holding motor disc brakes, direct drive gear reducers and more. Choose from our Worm Spur Series, Helical Spur Series, Helical Worm Series, and Helical Parallel Series based on the needs of your project. 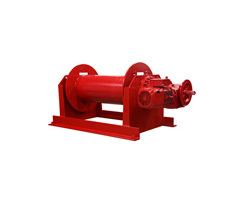 Perfect for lifting applications, these low-cost winches provide the flexibility that others cannot. Thern’s Worm Spur Series provides an electric winch that will lower your maintenance costs while getting the job done every time. The 4WS Series has a 7,000 to 26,000 lb. capacity. 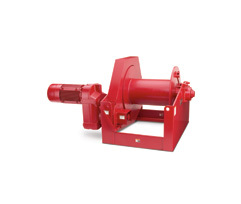 These electric winches feature dual-stage gear reduction for economical handling of large loads. The combination of helical/worm and spur gearing make these electric winches ideal for applications requiring secure load control and accurate positioning. Thern’s modular design means we can quickly customize these winches to meet your specific requirements. Thern’s Helical Spur Series provides a low-cost, flexible, clutch option, good for pulling in a wide variety of situations and environments. If you have a pulling application that requires a clutch for paying out line, our 4HS model hits the mark every time. The 4HS Series has a 5,000 to 56,000 lb. capacity and feature dual-stage gear reduction for economical handling of large loads and are ideal for applications requiring long travel distances and faster line speeds. Thern’s modular design means we can quickly customize these winches to meet your specific requirements. 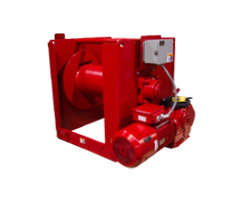 Thern’s Helical Worm Series offers an enclosed, flexible, electric winch, good for lifting in any environment. This winch has fully enclosed direct drive gearing, lowering your maintenance costs and delivering consistent performance for your most demanding lifting applications. The 4HWF Series has a 1,500 to 8,000 lb. capacity and feature helical/worm gearing making them ideal for applications requiring secure load control and accurate positioning. 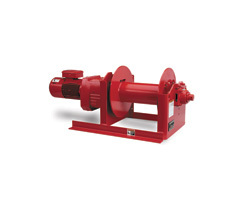 The enclosed, direct-drive gearing design delivers dependable operation and helps reduce maintenance, while a modular design means we can easily customize these winches to meet your exact specifications. Thern’s Helical Parallel Series offers an electric winch with fully enclosed direct drive gearing, lowering maintenance costs and delivering consistent performance for your most demanding pulling applications. The 4HPF Series has a 2,000 to 25,000 lb. capacity and feature helical/parallel, high-efficiency gearing making them ideal for applications requiring long travel distances and faster line speeds. The enclosed, direct-drive gearing design delivers dependable operation and helps reduce maintenance, while a modular design means we can easily customize these winches to meet your exact specifications. Thern’s Helical Bevel Planetary Series is perfect when you need serious pulling or lifting power. Ideal for heavy-duty applications requiring long travel distances and quick line speeds. The 4HBP Series has a 35,000 to 100,000 lb. capacity and these electric winches feature enclosed, direct-drive gearing design that delivers dependable operation and helps reduce maintenance. Thern’s modular design means we can easily customize these winches to meet exact specifications. If you have special product needs, simply give us a call! Our engineering and production teams are experts at modifying existing models and designing a custom winch for your specific needs. In fact, over 60% of our business involves custom engineering, so don’t hesitate to contact us if you don’t see what you want on our site or in our catalog. We specialize in quickly turning around custom orders.